An asado in Chile will, at first, feel familiar to anyone who grew up barbecuing in the US. The two have some things in common: meat, beer, and plenty of people. But there’s a crucial difference that elevates an asado. Rather than steaks and hot dogs thrown over some lighter-fluid-soaked coals, a Chilean asado is all about breaking down a whole lamb. Asado is, by definition, barbecue. The cooking techniques and ingredients, however, vary widely by region. Just like barbecue in California is different than in Texas, asado in Chile is different than asado in Argentina. Southern Chile is the land of sheep, and around 64 percent of the country’s 3.9 million sheep are raised there. So it shouldn’t come as a surprise that Chilean asados are centered around lamb, and it’s some of the best barbecue you’ll ever taste. 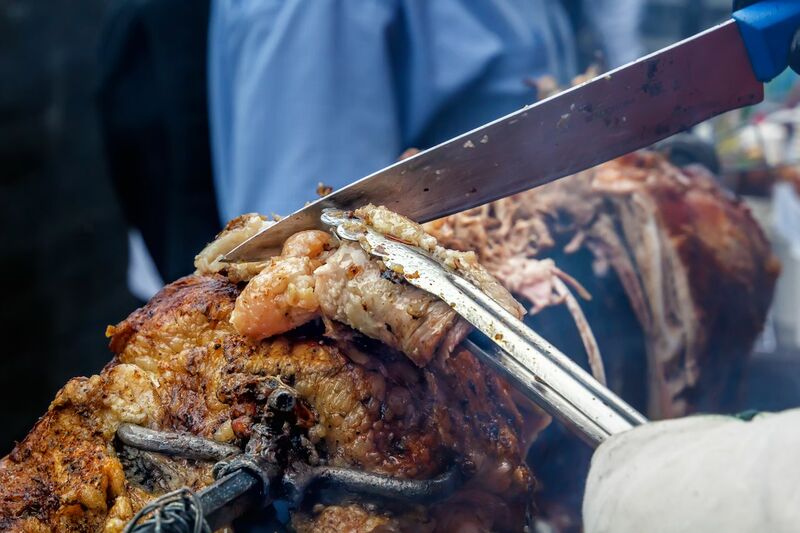 Whole-lamb asados hold a special place in the Chilean culture. It’s not an everyday event — you might have one a few times a year at most. Unless, of course, you work at a Patagonia fly fishing lodge like I did, where the guests turn over weekly and each new group wants the same experience. At the fishing lodge where I was guiding, our staff would go through the rituals of an asado at the special request of clients. I’d selfishly encourage people to make the request, and if they forgot, I’d be sure to let the staff know the guests wanted some lamb for lunch or dinner. Over the course of my time at the fly fishing lodge, I learned just how good a Chilean asado can be. Each person has his or her own preparation preferences. It’s like roasting a turkey on Thanksgiving — people always think their way is the best way. The debate over the proper methods starts while the lamb is still alive, and it gets passionate. My Spanish is mediocre at best, but I had no issue reading two former managers’ hand gestures as they argued over the best method of slaughter. One preferred a violent blow to the head to ensure an instant death, which is how slaughter is usually handled in the US. The other preferred slitting the throat to cut the lamb’s main artery and bleed it out. Ultimately, they are debating which method creates less struggle and results in a more tender cut of meat. The Food and Agricultural Organization of the United Nations (FAO) notes that animals that are stressed just prior to slaughter are less palatable, but I’ve tried meat from both methods and didn’t notice a difference. After the slaughter and cleaning, it’s time to cook. First, the lamb is either quartered or halved and stuck on a long metal spindle. (Cooking it whole on a spit or splayed out like a spatchcocked chicken are two other options, but quartering or halving is generally easier.) Two forked spikes are driven into the ground, and a fire is built between the spindles. As the fire burns down to a hot bed of coals, the meat is thoroughly rubbed with salt. Then the spindled lamb is placed between the forks, and the parrillero (grill master) monitors and rotates it to cook the meat evenly. Lamb fat bubbles to the surface as it heats up, combining with the salt. This goes on for hours and is typically accompanied by a few cold Escudos or a Pisco Sour. Put plainly, it’s not your dad’s backyard cookout. Even if lamb isn’t your meat of choice, asados are all about the social gathering. If you really want to enjoy an asado meal in Latin America, spend some time with a community and get to know the locals. If you get in tight enough, they just might invite you over for a family or neighborhood asado. Enjoying the meal as a casual experience with friends is the best way to eat asado, regardless of the meat and preparation style used.